Water damage isn’t something any property owner in Calvert County wants to deal with, but most have to at some point. Water damage can happen to your home or commercial property in many different ways. You might experience a leak in your roof from a rainstorm or maybe your windows are not sealed well enough and water has pooled up and caused the frames to rot. But some types of water damage are very subtle, very hidden, and very difficult to find! Water leaks in walls, in attics, and in basements are common types of water problems in homes and businesses. 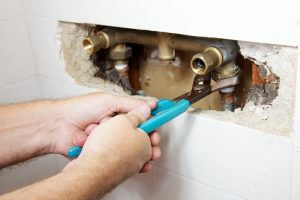 The problem is that because the leaks are usually slow-moving and in places where people do not visit often, the damage slowly builds until it becomes a major problem! Below is a list of things that you can do to keep an eye out for any hidden water problems on your property. Pay attention to the meter – If you have a leak in any part of your plumbing, you’ll notice it the water meter. The best way to use the water meter is to shut off all of the water to your home. If you see the meter changing quickly, there is a big leak. If not, give it a couple of hours and check again. If the meter changes even though all of the water is shut off, there is probably a leak. Check usage levels – There are measurable usage levels that you can monitor. Typically, a family of four will use less than 12,000 gallons of water per month. If you want some more numbers, check out the U.S. Environmental Protection Agency’s website. If your water usage is much higher than 12,000 – it could indicate a problem. Is your monthly water bill changing? – Water habits don’t change often so your monthly water bill should be pretty consistent each month. If you start noticing a steady increase over a few months or even a big jump one month, there could be a problem with your plumbing. Don’t forget to have a plumber check all of the pipes that are part of your system, some of them may be too difficult to find on your own or are buried underground. Check your toilet bowls – You might think that a toilet water leak would be easily detected but that isn’t always the case, very slow leaks will drip and dry with a flush. This doesn’t mean the leaking water isn’t causing damage in the meantime. The best way to check is to add a bit of food coloring to your toilet tank and wait about 10 minutes. The color will be noticeable quickly outside of the toilet. If you find a water leak, you’ll want to have a plumber help resolve the source of the water flow and stop it immediately. However, after the plumber has stopped the water leak it may be essential to call a water remediation specialist that can help clean up and repair any damage to your home. In Calvert County, Regional Property Group is a highly educated and trained water damage restoration company certified by the IICRC. Regional Property Group is a local, Veteran-owned Southern Maryland disaster restoration company that performs emergency restoration services for commercial and residential property owners. We specialize in water damage restoration, fire damage restoration, and mold removal, and provide emergency 24/7 response after a disaster. © Copyright 2019 Regional Property Group. Powered by Spot On Solutions.